Dr. Katja Ahoniemi tells about the differences and similarities of MBA and EMBA programs. Have you ever wondered what the difference between MBA and Executive MBA pro­grams really is? The typical answer to that ques­tion revolves around statistics and timetables. EMBA students tend to have more years of work experience than MBAs. Also, EMBA programs are, almost without exception, delivered on a part-time basis, whereas MBA programs come in both full-time and part-time formats. While that information is useful to a certain point – it tells a potential candidate whom they can expect to meet in the classroom, and how they need to schedule their work and study re­sponsibilities – it doesn’t yet tap into the core of the differentiation. There is no magical age or amount of work experience that transforms each person from an MBA to an EMBA candidate. What is crucial is the stage each candidate’s ca­reer is in". What is crucial is the stage each candidate’s ca­reer is in. MBA students are explorers: they are still figuring out where exactly they should head in their careers, and want to use the MBA as a springboard into new opportunities. EMBAs have accumulated managerial experience and found their groove, and are accelerating or cementing their professional path with the degree. EMBAs are more likely to have existing business experi­ence. MBA students may have a prior degree and professional experience from a field such as engineering, but find themselves drawn to the world of business and hence need to enhance their skillset to meet their aspirations. EMBAs are more aware of how they function as managers, but MBAs need to dig deeper and often explore their personal strengths and areas of leadership development for the first time. MBA graduates are more likely to change ca­reer paths, jumping into new functional areas of a business or switching industries. To prepare for this, MBAs get their hands dirty and delve into a deeper, more practical level in their business stud­ies. EMBAs approach the topics from a more stra­tegic viewpoint, learning to fluently converse on all areas of business in the boardroom. So MBAs learn to crunch numbers, EMBAs need to under­stand which analyses to ask for, and how to trans­late the results into sound strategic moves. EMBA programs tend to be generalist, whereas MBAs specialize in a certain area through their electives." EMBA programs tend to be generalist, whereas MBAs specialize in a certain area through their electives. MBA students often fund their studies themselves, whereas the employer of an EMBA student is likely to be paying for the tuition. Both MBA degrees naturally have many things in common: everyone has an interesting back­ground that they can draw on to share experi­ences in the classroom. All students go through a transformative experience, learn about the core areas of business, improve their teamworking skills, and receive new networks. Regardless of the E, all graduates are equipped to jump-start the next phase in their careers. Dr. Katja Ahoniemi has worked as an Associate Director of Degree Programs at Aalto EE and a full-time MBA program director at Imperial College London. 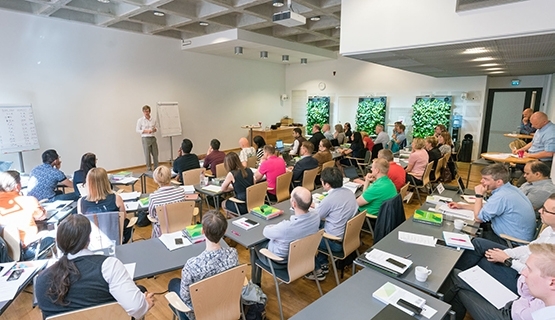 Currently reading: Aalto Leaders' Insight: What’s in an E – especially if it’s in front of MBA?